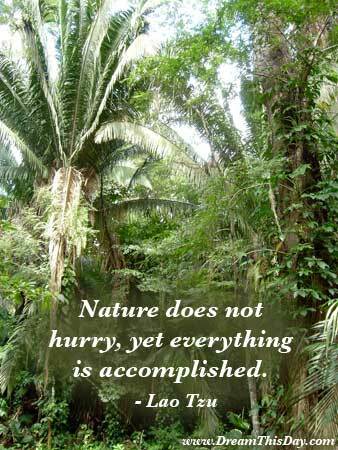 Welcome to these Nature Quotes of the Day from my large collection of positive, romantic, and funny quotes. Nothing is evil which is according to nature. reminders of an unspeakable beauty. and give strength to the body and soul. that bends over it and whispers, "grow! grow! Mere goodness can achieve little against the power of nature. in the infinite leisure and repose of nature. Perhaps nature is our best assurance of immortality. with which nature hath furnished them to the shame of art. so that not a snowflake escapes its fashioning hand. of what nature has revealed to us. and to have my senses put in order. or next year, but eventually she's going to come around and whack you. You've got to be prepared. stay close to nature. It will never fail you. Maybe nature is fundamentally ugly, chaotic and complicated. But if it's like that, then I want out. but nature does not depend on us. We are not the only experiment. Nature will bear the closest inspection. and take an insect view of its plain. All things are artificial, for nature is the art of God. she creates a genius to do it. and horribly cruel work of nature! relation to nature than we know. The keeping of bees, for instance. a study of contrasts: joy/sadness, full/empty. and climb a mountain or spend a week in the woods. Thank you for visiting: Nature Quote of the Day.